← If children ‘published’ books, would there be a market? Not only is science fun, it could have a big payoff for students. 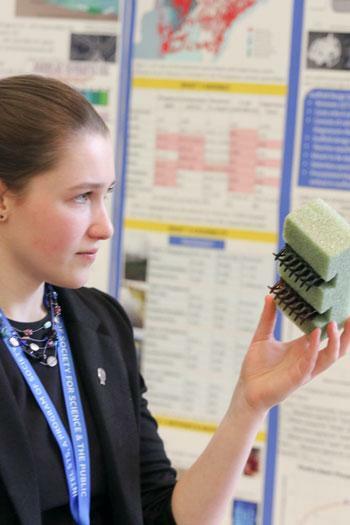 The Intel International Science and Engineering Fair (of ISEF), the world’s largest pre-university science competition, really rewards budding scientists,engineers and inventors.. This year three students won the top $150,000 prize each. Second place winners won $75,000 each. This year’s ISEF Fair will be held here in Phoenix from May 8 – 11th. I plan to be there. Interestingly, three Sri Lankan students will be participating in it. Founded 75 years ago, the fair attracts some 1,700 high school students from over 75 countries, regions, and territories who showcase their research and compete for approximately $4 million in prizes. One of the winners (left), 17-year old Paige Brown, found a way to filter pollutants in stream water, and has nano-technology in her sights to expand on the device. The future generation of scientists and policy makers like Paige will be updating the science. Other students are ‘discovering’ new ways for disease management and medical breakthroughs. All this while still in school!